Note: You should not use cold water therapy if you have uncontrolled high blood pressure, Raynaud's disease, or vascular disease. This information is for educational purposes only and is not meant to prescribe. As always, consult with your health care practitioner if you are pregnant, breastfeeding, or suffer from any medical conditions. Freezing your tail off really does toughen you up. From HealthCentral.com: “When the cold water hits your skin, the nerve endings activate endorphins in the brain which stimulate your immune system.” Several studies have also shown that those who take daily cold showers have a reduced number of sick days. Study results published on www.endocrine.org indicate that “Cold Exposure Stimulates Beneficial Brown Fat Growth“. What's “brown fat”? Brown fat, also known as brown adipose tissue (BAT), is a special kind of fat that burns energy and glucose to generate heat. It keeps small animals and babies warm, and animals with abundant brown fat are protected from diabetes and obesity. Another study “Cold-Activated Brown Adipose Tissue in Healthy Men”, suggests that stimulating the body’s cold response with cold and diet may serve as a means of preventing or treating obesity. Not all body fat is created equal. Brown fat is activated for heat and energy much more easily than white fat. Normally brown fat levels decrease with age (which is probably one of the reasons older folks get cold more easily). With regular training and purposeful cold exposure, you can help reverse this trend. 3. Get Healthier Hair and Better Skin. Who doesn't want to look good as well as feel good? Warmth and warm water opens pores and hair follicles, allowing dirt and impurities to be rinsed away. A cold rinse closes them back up again and reduces swelling by constricting the blood vessels. This gives you bright, healthy skin and shiny hair. Let's face it – most of us tend to sit too much. Over time, poor blood and lymphatic flow can lead to a host of problems, including edema, varicose veins, cellulite, blood pressure irregularities and more. If the blood and lymph don't move through the body, they can't do their jobs of providing oxygen and nutrients and removing toxins. A combination of dry brushing and cold rinses is one of the simplest things you can do to help the body heal itself. If the blood and lymph don't move through the body, they can't do their jobs of providing oxygen and nutrients and removing toxins. A combination of dry brushing and cold rinses is one of the simplest things you can do to help the body heal itself. In dry brushing, we use a dry, soft bristled brush (they have brushes specifically for it, but a good shower brush will do) to brush the skin prior to your shower. There are several different techniques. Some suggest starting at the extremities and brushing in straight lines towards the core, some suggest starting at the extremities and brushing in circles towards the core, and some suggest brushing in specific paths around the core first to clear congestion and then brushing inward from the extremities. Many cultures have traditions of using hot/cold cycles or cold immersion to clear the mind and body. There’s nothing quite like intense physical stimulation to bring you into the present moment. 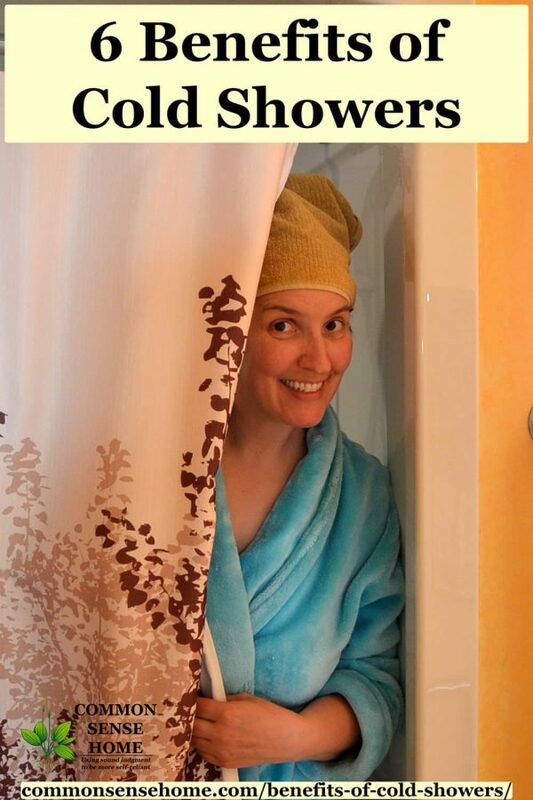 Facing a cold shower in the morning on a daily basis may also help you tackle other challenging tasks. A recent study has shown that cold showers may help alleviate depression by triggering electrical impulses that stimulate the brain's “blue spot”, which is the brain's primary source of noradrenaline. Like the idea of improving your health but hate the cold? Start slowly. You don’t have to give up hot showers. I usually do a “James Bond shower“, i.e., turning the temperature to cold at the end of my regular hot water shower. Stick one leg in, then the other, followed by the arms, and then finally the torso and face. With Wim Hof Cold Shower Challenge, they found that participants noticed benefits with just 30 seconds of cold exposure at the end of their regular showers. I've gradually built up my tolerance over time to use colder water and longer immersion. My youngest son sometimes showers in cold water only, but he also did the Polar Bear Plunge into Lake Michigan and rolls in the snow wearing nothing but swim trunks. 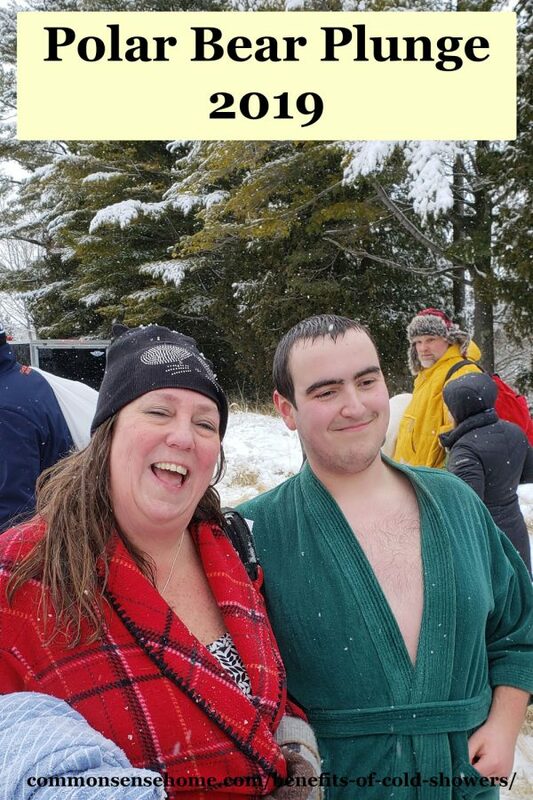 My youngest son and a family friend after the Polar Bear Plunge at Jacksonport, Wisconsin. I feel “perked up” more than with just a standard shower, enough so that I have walked barefoot in the snow. My skin feels firmer and smoother, and is less dry and itchy. If you’re still not sure about cold showers, you can also try exposure to cold temperatures. Researchers have found that study participants exposed to roughly two hours of 60 degree temps per day showed increased ratios of brown fat to white fat. Please note that this isn’t a “magic bullet” for weight loss. I have friends who are heavyset and keep their dwellings in the 50s and don’t lose weight. Cryotherapy is also available as a professional service from select spas and health and wellness centers. These treatments typically involve sitting in a cryotherapy booth, which may be used to apply cold to specific areas or the entire body. In the books “The Way of the Iceman” and “What Doesn’t Kill Us”, they discuss a wide array of cold treatments to challenge the body, from ice baths to climbing mountains without cold weather gear. These are the books that inspired my son. Don't worry – he’s playing it safe with cold showers and short rounds of cold exposure here in Wisconsin. There’s no mountain climbing planned in our immediate future. If you’re interested in more extreme cold exposure, check with your doctor first, just in case. People have used cold therapy to treat depression and put autoimmune conditions into remission, but it can be dangerous under the wrong conditions. Be careful out there, folks. Let me know if you decide to give the benefits of cold showers a try. Who knows, maybe we'll need to start up a Polar Bear Club specifically for Common Sense Home readers? Thanks for reading, and make sure to share with your friends who are afraid of the cold. We have over 100 home remedy and natural health posts on the site, which as listed by category on the Home Remedies page. Originally posted in 2011, updated in 2019. I am such a cold water sissy, but as an older ( ahem ) woman I am going to do some research on this for cirucation. Thanks for posting! Ok, this does sound a little crazy but from what you wrote, it's worth a try! My mother always rinsed my hair in cold water and it drove me crazy. Now, it all makes sense… it always does as we get older hey? It's never to late to help your body heal itself. I've had friends and family comment about my lack of gray hair, too. (I'm 41, and have plenty of friends with salt and pepper hair). I've got a few strays, but I suspect the diet changes are helping to keep the rest of the hair intact, as well as keeping it softer. What do you mean by dry brushing? Is it with a dry shower brush? I will share that I am brushing my long long hair vigorously twice daily with a copper bristled hairbrush and my scalp and hair are staying clean several days longer than before. The goal of dry brushing is to stimulate the skin and lymphatic system to increase blood flow and promote healing and detoxification, similar to the effects of a cold rinse. They work well together. As we age, it is not uncommon for toxins to build up in the lymphatic system and lead to inflammation. These are a couple simpel things you can do to keep everything moving. I remember a while back reading about an older boy adopted from an Eastern European country. He took cold showers, and his new parents tried to get him to take warm showers and he HATED it. All to say, you like what you get used to. I love that you referenced Lake Michigan. My babysitter took my brother and I on a day trip there when we were little. We spent six hours swimming in the lake and only felt a bit cold near the end. She only put her feet in it and declared that we had no nerve endings. I’m an adult now and suddenly I’m like my babysitter. Since when did my nerves become so sensitive? I really should try a cold shower to develop that tolerance again! As for Superior, that is a whole different level. I now live in the Keweenaw, about half an hour from the lake. I went to the beach for Midsummer and after wading for three minutes my feet were blue. Young children only went waist deep in it. One of my mother’s friends, on a dare from her children, jumped into Lake Superior in July. She said she wasn’t completely warm again for at least a week. I doubt I’ll ever build up the tolerance to swim in Superior. lol – yes, Superior is a special kind of cold. I went to college at UWSuperior, and even in high summer, that lake just never gets warm. Michigan really varies by the year. Some years it’s not too bad by the shore, but summer 2013 it just never warmed up because of the cool temps. I always end with a cold rinse and have for years. I have found another benefit, as well. I keep my house cool in the winter (17C). When the wind is strong, I feel the cold. If I take a shower, afterwards I do not feel cold even though my hair is wet. A cold shower is a necessity after being in the sauna or hot tub. That’s why the Scandinavian countries build their saunas outside – so they can roll in the snow afterward! Alternating hot and cold works as a pump for the blood. When you are injured, say a sprain, white blood cells flock to the area causing a traffic jam. Put an ice pack on it for 10 minutes, leave it off for 50 minutes and repeat twice more. The cold causes the blood to leave the surface and closer to the injury, then the blood moves back to the surface, pumping the blood to clear out the white cells. For a stomach ache, feeling too full or menstrual pain, soak unbleached muslin (or whatever thin cotton you have) in cold water, then wring it out. Wrap the cotton around your waist so that it covers your belly and down to your hips. Leave it on for an hour. Again the blood moves away from the surface so it can concentrate on the organs inside. You will be amazed at the difference you will feel! When I do this, I have a sheet of plastic (actually a green garbage bag slit down both sides) that covers the wet cotton. Then I put my clothes back on and go about my day. Probably best not to go out anywhere 🙂 If the problem is with your lungs, do the same thing but with a cotton T-shirt. For full body detox you will need help from another person, a cotton sheet and plastic that goes around you and covers you from neck to feet. You need to lie down for this treatment so put the plastic down where you want to be. Put the sheet in cold water and wring it out. Put it on the plastic and lie down on it on your back. Your helper wraps the sheet around you, including your arms, and tucks it under your feet so they are enclosed. Then the same thing with the plastic. Stay there for an hour. You should be naked or in a swimsuit (depending on who is helping you). This will help a person who wants to quit smoking. It works best if the person can go 3 days without smoking; do the wrap on the fourth day. Be ready for the smell when you unwrap!! Lots of tar and nicotine on the sheet. The smell alone is a powerful deterrent but the purge of those substances will reduce or eliminate the urge. It will also help if you tell that person that s/he smells like that sheet when they smoke. All of these uses are called hydrotherapy. Hydro means water. I learned hydrotherapy and massage therapy in the same program. I’m sure would like to know how hydrotherapy helps you if you try it. Interesting! Thanks for sharing. I’ve heard the term hydrotherapy, but haven’t looked into it much. Okay Laurie, you’ve never steered me wrong …….so far :). I am aging a little less gracefully than most (i.e., looking in the mirror and exclaiming “when the hell did THAT happen? !”) I will try the cold rinse and see if I notice any after effects. I wonder if the intensity/duration of the cold is proportional to the level/quantity of benefits? I might even try a little cold weather exposure. Well, as long as strangers don’t come rushing up to me in the Walmart parking lot to offer me their coat……I’m not sure they would believe I was practicing cold tolerance rather than displaying senility…… I’ll let you know what happens! Thanks for the post! Happy 2019 to you and your family! I hear you! This year those crazy grey hairs keep popping up, my joints ache more and my lips are dryer than they have ever been. It’s all pretty typical stuff with the hormone changes and such, but it all has me working on upping my game for self care. I dug up the results from the hot to cold shower challenge mentioned in The Way of the Iceman and added them to the post. Those folks didn’t see a different in 30, 60 or 90 second showers, but it looks like they were focused on energy levels and illness, not skin and hair. If nothing else, the cold certainly wakes you up! Oh Laurie – I really tried. I screwed my courage to the sticking place and turned off the hot water tap while turning up the cold. I was able to let the cold water rinse my hair for a few seconds (my neck was stretched out so far I imagined I was like a giraffe)…then stepped forward. And immediately pulled back. YIKES! Overcoming flight-or-flight will take some practice. I’m not sure I can do it. I’d love to hear about others’ experiences if they try the cold rinse. ? Part of what Dunc was reading in the books included some deep breathing to calm and center yourself before exposure. As noted in the post, easing yourself in helps. “Stick one leg in, then the other, followed by the arms, and then finally the torso and face.” Going straight for the scalp, while very bold of you, is also likely to strongly trigger your “get the heck out of here” reflex. I’ve also found that if I turn it partly cold and have a few seconds to adjust, I can then turn it colder without as much panic.